WHEELING — Diaper drives conducted by the Wheeling Serra Club and supported by Team Sledd and other donors have been keeping West Virginia babies warm and dry. For the past eight years these diaper collections have helped the Gabriel Project assist disadvantaged families with infants and children two years of age and younger. 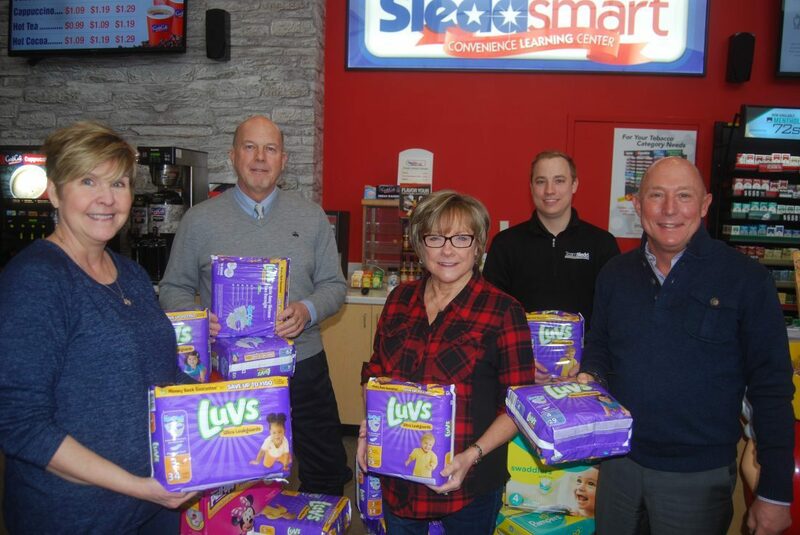 The Serrans’ efforts and those of other donors are multiplied significantly thanks to Gabriel Project volunteer Dianne Sincavich, who arranged for Team Sledd, the convenience retail product supply giant, to match diaper donations up to 5,000 diapers. Mrs. Sincavich’s husband Rob is Team Sledd’s President. “Thanks to the generosity of Dianne and Rob Sincavich, the Wheeling Serra Club and our other donors, we collected more than 17,000 diapers last year to help West Virginia families,” said Faith Hicks, Gabriel Project Northern programs coordinator. Ms. Hicks said she is amazed and heartened by the support Gabriel Program of WV receives. For instance, parishioners at St. James Church in McMechen, which runs a food bank, heard about the diaper drive and got involved in a big way. “Last year they collected more than 5,000 diapers for the drive,” she said.